Setting up your Google shopping campaign priorities can also bring another level of optimisation that your competition fails to take into consideration. Most campaigns already have a “Low” priority, but you can change this priority to “Medium” or “High” and these priorities will determine the bid for any product that the campaigns share. This advanced strategy gives business more control over which keywords their products show up for. It also allows them to isolate and dedicate budget to search queries that convert well. When to use & how to assign priority settings? 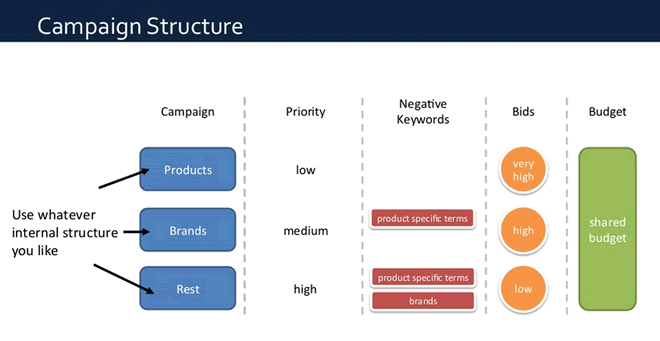 Campaign priorities won’t affect your search relevance or influence how well your product show for a specific query. Rather, priorities are a useful feature to set which products and their corresponding bids are most important to you, in order to favor certain products over others. Priorities are all about the type of search query your audience uses. Google Shopping campaigns are a powerful way to get your products in front of motivated prospects. Yes, 1 in 3 searches starts with a Google search, yet not everybody comes to Google with the same interest or buying intent. That’s why your campaign will benefit if you optimize it for shoppers at different buying stages, from awareness to buying. For example, imagine 2 campaigns that share the same product. One campaign has a High priority, and the other has a Medium priority, Google will use the bid from the High priority campaign first, even if the bid in the Medium priority campaign is set to a larger amount. If the highest priority campaign runs out of budget, then Google will pull from the lower priority campaign bid. If the campaign with the highest priority runs out of budget, the next lower priority campaign will place the bid. 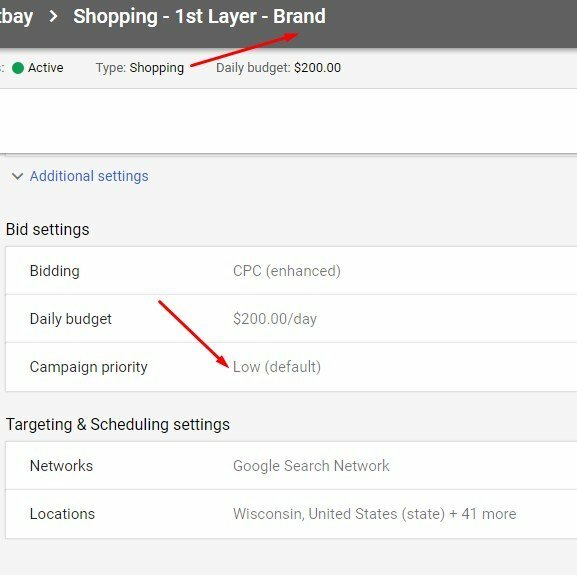 When you have the same product in multiple Shopping campaigns, you can determine which campaign should participate in the auction for that product with campaign priority settings. You can use priorities depending on what products you’d like to prioritize sells for, such as your best sellers or even promoting products that are on promotion. In the first scenario, you can use the high priority setting on a group that promotes sale products over those offered at full price. Adding a “Sale” custom label to any products on sale within the feed allows you to add those products to a high-priority Shopping campaign. In this scenario, if someone searches with a keyword that could apply to both a products on sale and one at full price, the sale item will be prioritized in search. This kind of ad prioritization will helps boost conversion rates, incentivizing the searcher to buy your offer, especially if part of your audience is motivated by price. This type of prioritization is useful when you want to sell your best-performing products. The high-priority campaign is the same as above, created using custom labels applied to sale or promotional items. This type of prioritization is an efficient way of increasing impression share on generic terms without wasting ad spend on users in the too far in the top of the buying funnel. This scenario is designed to capture people who already know exactly what product they want to buy – e.g., someone searching for “tortoise shell keyhole eyeglasses” (specific long tails) rather than “hipster glasses”. The results come from excluding short-tail search terms and making sure that only long-tail search terms were being captured. Short-tail queries are filtered down into the medium-priority campaign to capture users who are still in their research phase. By segmenting search queries in this way, the campaign is optimized to prioritise long-tail search queries and increase generic impression share specifically for those terms, where the scenario is more likely to lead to a conversion. There you have it – the last step in our team’s optimization process. > If you want to revisit all the chapters, and read our final thoughts, you can always go back to the whole Google shopping optimization guide!